Delicious cuisine, Chinese wine and cross-cultural friendships are at the centre of this year's Chinese New Year celebrations at Charles Darwin University (CDU). Tuesday 5 February marks the start of the Year of the Pig, and hundreds of millions of people across the world will celebrate this annual lunar event. To celebrate, CDU’s Confucius Institute (CI) will hold a "Chinese Corner", with a special presentation on Chinese dietary customs and dining, on Friday 8 February. CI Director Professor Martin Jarvis said the event was an opportunity for the community to celebrate and learn more about the Chinese culture. 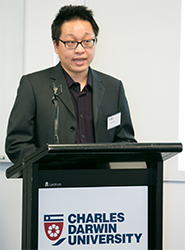 "Everyone is welcome to come and hear about the Chinese food customs from our lecturer Mr Zhi Gao," he said. “Chinese dining and dietary customs are so different in many ways to ours in the West. "People attending the event will be able to sample the many different types of food, such as dumplings, sesame balls and of course fried rice, roast duck and sticky cake. "Afterwards, a special Chinese wine tasting will be held, for those interested." Professor Jarvis said the institute has evolved into an important hub for engagement with Chinese culture in Darwin over the past six years or so. CI Chinese Director Associate Professor Wang Hua, from Hainan University, said the institute held a range of programs and cultural activities throughout the year including Chinese traditional art, music, film, language programs and Tai Chi to engage with the community. The Year of the Pig is associated with wealth, emotion and intuition, and is seen as fortuitous for those born in 1935, 1947, 1959, 1971, 1983, 1995 or 2007. Chinese Corner is on Friday 8 February, 5.30-7pm, at the Confucius Institute Meeting Room, Building Orange 2, Level 4, Room 24, Casuarina campus. RSVP is essential, T: 8946 7677 or E: ConfuciusInstitute@cdu.edu.au.